Join Pak Navy as PN Cadet registration apply online eligibility qualification with last date information here at. The candidates who are looking for commission officer jobs in Pakistan Navy in Operations Branch, Navy Marine Branch, Engineering and Supply Branch are welcome to apply online for Pak Navy. Candidates who have passed F.Sc Part 1 are also eligible to apply on hope certificate for 60% marks. Matric with F.SC or O/A Level with minimum 60% marks. Join Pak Navy as PN Cadet as 10% Relaxation in F.Sc/A Level marks 50% for Bloch candidates instead of 60% as applicable for others. Applications sent directly to Recruitment Directorate at Naval Headquarters. Online registered candidates must bring postal order of Rs. 200/-(Crossed in the name of Director of Recruitment HNQ Islamabad) or Case in lieu of postal on the day of entrance test. Entrance test result can checked from respective PNR & SC or by visiting PN website: www.joinpaknavy.gov.pk. The candidates are advised to get their Ears & Teach cleaned by specialist doctor. Final selection by Naval Headquarters on merit. Grant of permanent commission after two years of training of Join Pak Navy as PN Cadet, following degrees shall be awarded upon completion of basic training. Note: Subject to aptitude and academic progress, selected officers may be sent abroad for MSc and PhD. Free Medical treatment of self/family and parents. Opportunities for visits/ courses/assignments abroad. 50% Concession for self/family on travel by Air/Railways. Subsidized education of children in Bahria College/University and professional institutions. Twice rejected by GHQ/NHQ/ISSB Selection Board OR once rejected by ISSB ad once rejected by GHQ/NHQ/ISSB Selection Board. Withdrawn from any academy / training institution of Armed Forces on any ground. Withdrawn from any boarded Armed Forces college/institution on disciplinary grounds. Dismissed/ Removed from Government Service including Armed Forces. Convicted by a court of law for offense involving moral turpitude. Declared Medically unfit by an Armed Forces Appeal Medical Board. 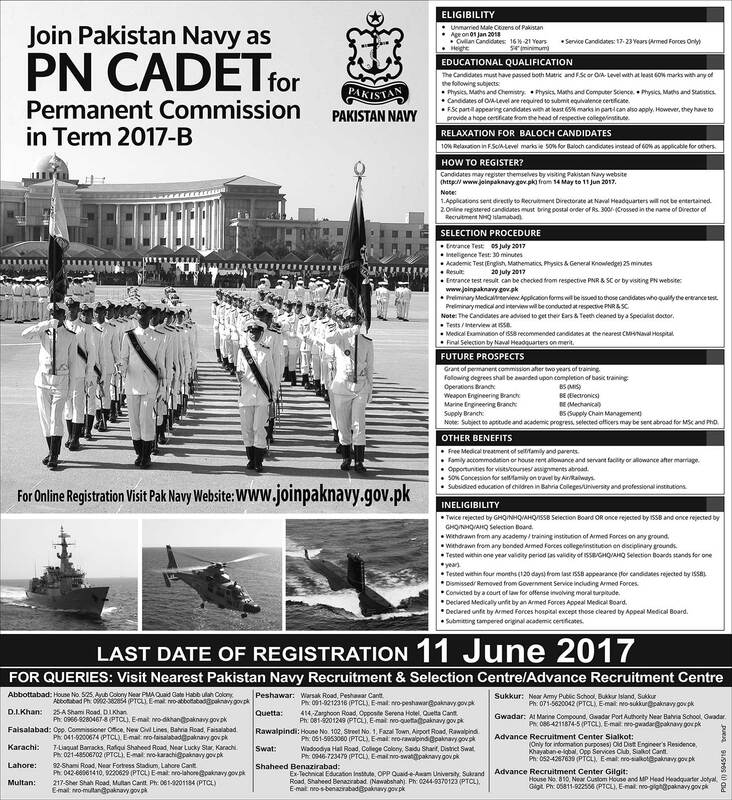 Last date for registration to Join Pak Navy as PN Cadet online is 11th June,2017. So remember it before apply and read all notes carefully. If you have any of problem about application submission then write us in comments section below.